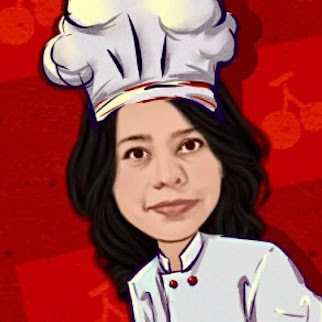 I was very happy to be invited by The FBAI for the launch of the super fabulous new spread in town called the Cadbury Diary Milk Spready and the Chocolate Cook book with 70 chocolate recipes written by none other than the famous chocolatier Zeba Kohli at Courtyard Marriott. It was a great pleasure to meet Saloni the founder of FBAI. I was also happy to meet many more people from the industry. The evening was well spend. We had the opportunity to taste the delicious Chocolate cake made with Cadbury Dairy Milk Spready. 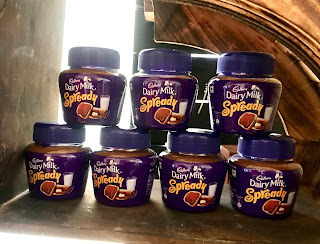 Anil Viswanathan the Director of Marketing introduced us to the Cadbury Dairy Milk Spready and launched the Chocolate cook book along with Zeba Kohli. The session was made interactive with a cooking competition using the chocolate spready. 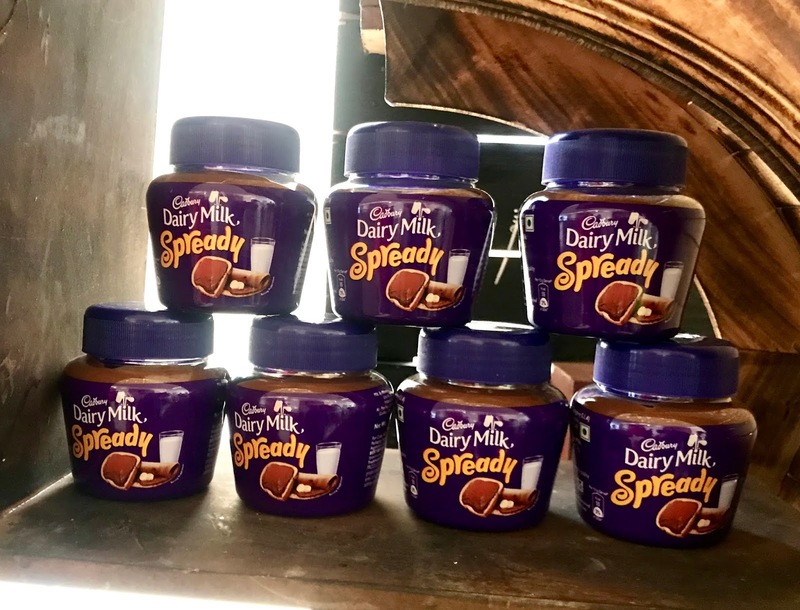 I got a bottle of the Cadbury Dairy Milk Spready as my daughter loves chocolate spreads. I was sure that she would love this one too. She did the honours of opening the bottle and tasting it and she loved it. 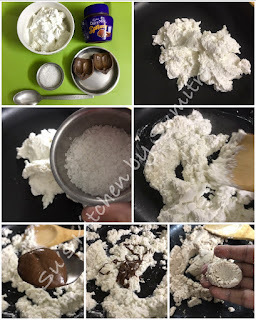 Since I had to make some sweet dish for Saraswati puja, I thought why not use the chocolate spready for a change and create a fusion. We Bengalis love Sandesh. 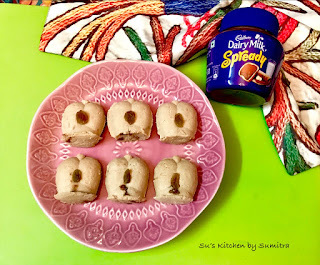 The Sandesh I made is called jolbhora where Date Jaggery is added, so I gave a twist to the traditional recipe and added the spready. Take a non stick pan, add the mashed cheena and sugar, on a low flame continuously stir the cheena for 2 to 3 minutes. Add a tbsp of Cadbury Dairy Milk Spready. Continue to stir until the cheena has become smooth and began to form a dough. Switch of the flame. Take the cheena dough on a plate. Now we have to make the Sandesh fast as the dough tends to dry up fast. Take the jhol bhora Sandesh mould or a modak mould will also do. Apply ghee on the mould. Take a portion of the dough and press it into the mould, with the help of your finger, create a cavity. 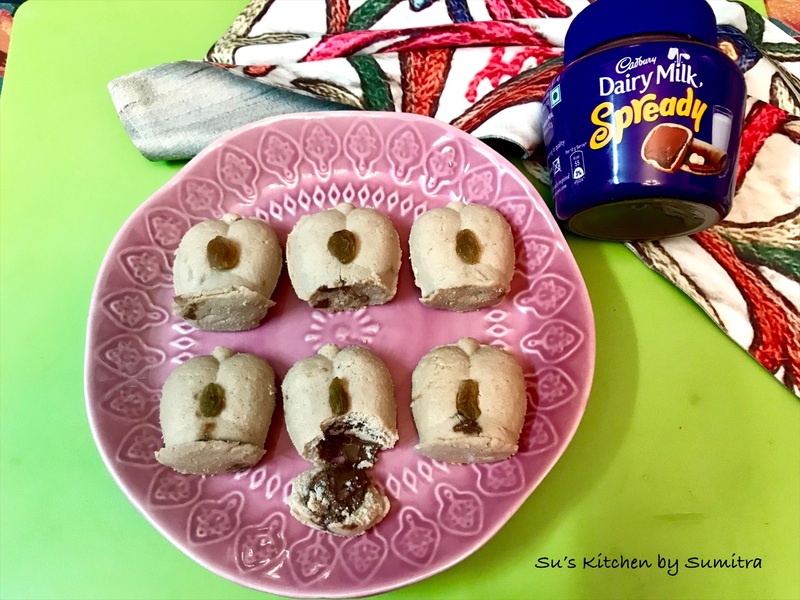 Pour a blob of the chocolate spready into the mould. Take a little more dough and cover the cavity. 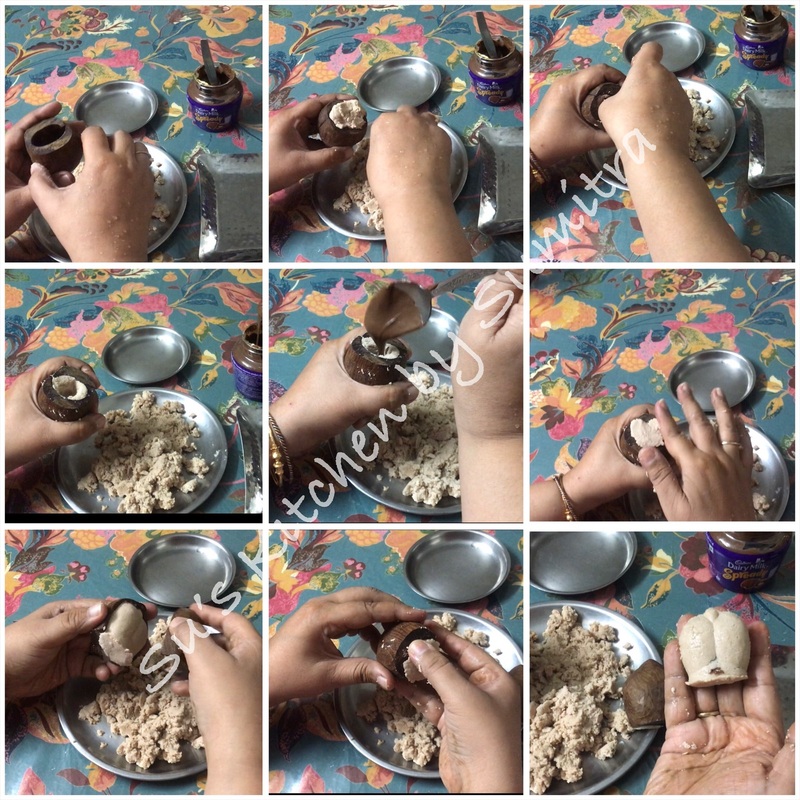 Now gently remove the Sandesh from the mould. Repeat the same process until the cheena dough is used up. Keep the Sandesh on a plate and place raisins on all the sandesh pieces. Tadaa, it’s ready to be indulge. 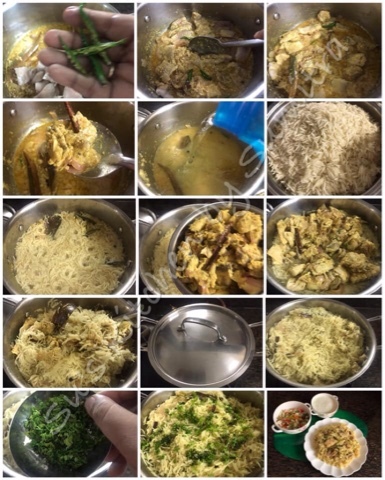 Aloor Chop is a famous street food of Kolkata. It is found in any Tele Bhaja shop (Shop which sales fried food) in any corner of the street. It is normally had in the evening with garm... garm.. chai ( hot... hot.... tea) and served with Muri (Puffed Rice). 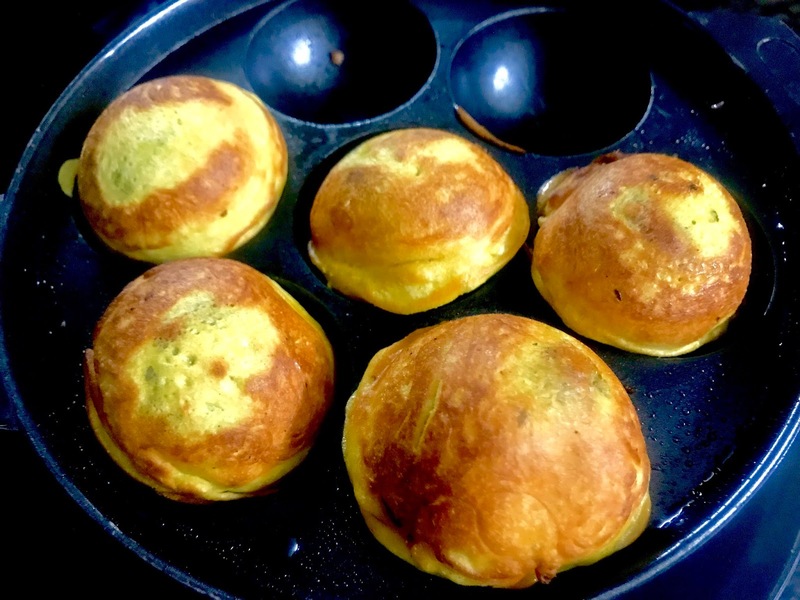 Today I have made these aloo r chops in an appe pan using very less oil. Take the boiled potatoes in a bowl, add ginger, chillies, coriander leaves, Bhaja Masala and salt. Mix the ingredients well. Keep it aside. 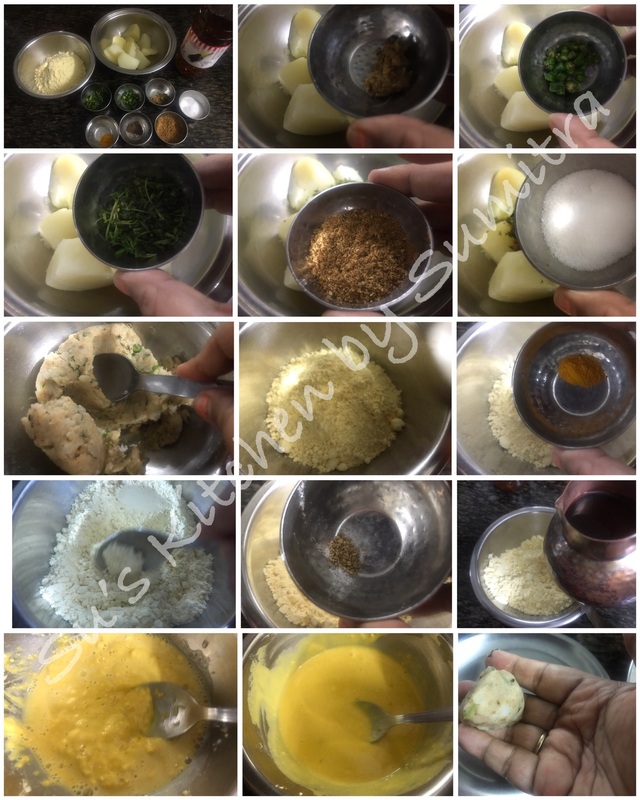 Take a mixing bowl with gram flour in it, add the salt and turmeric powder, mix the ingredients together, add the soda bicarbonate, mix it. 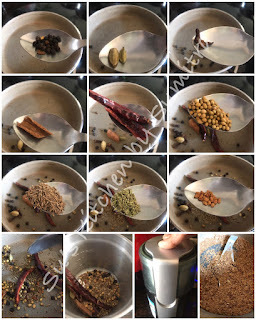 Add the carom seeds, mix it. Now add little water at a time and mix the ingredients together into a thick smooth batter. Take the appe pan, add 1/4 tsp of oil into each cavity. Heat the oil. Now dip a potato ball in the batter and place it into the appe pan cavity. Repeat the process. Cover the appe pan and let it cook for 2 minutes. Open the pan, check the chop, turn the chop and continue to cook until golden brown from both the sides. 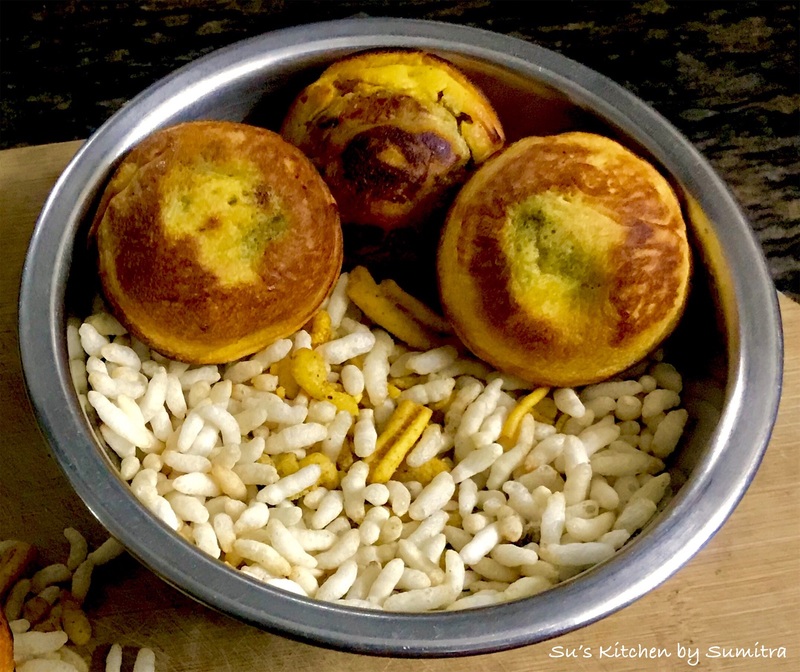 Serve hot with Muri (Puffed Rice). I absolutely love winters. The variety of fresh vegetables that you get to eat during winter is fabulous. I always love simple home cooked vegetables. 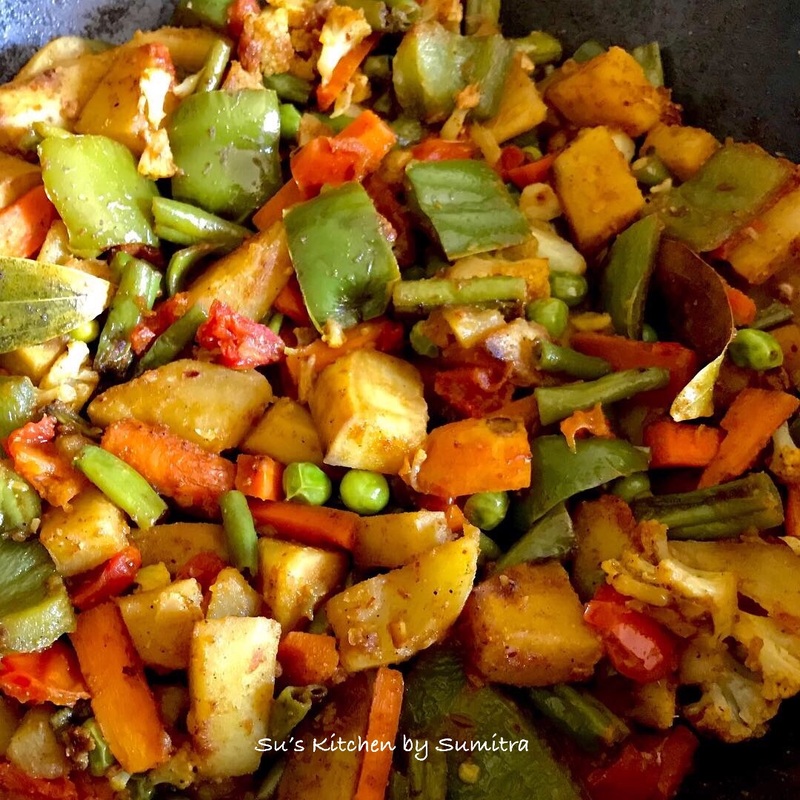 One of the winter vegetable dish is Niramish Tarkari - Vegetarian Sabji. 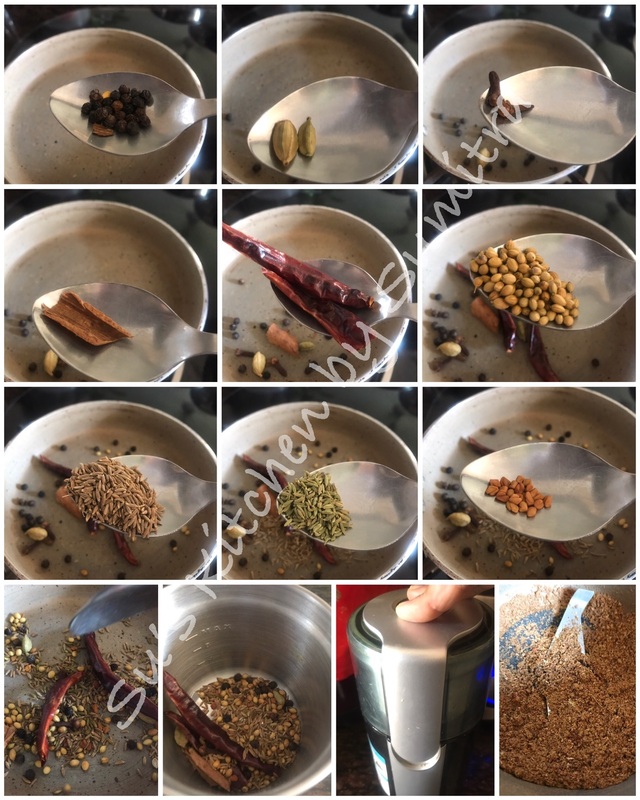 The ground roasted masala that is added in this recipe is different. It enhances the flavour of of this dish. The vegetables cook in its own water. 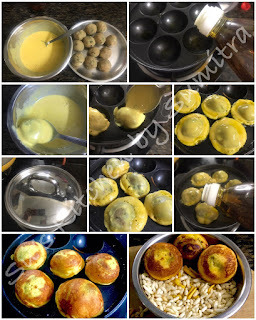 My Ma use to make this dish, this can be eaten with roti, chapatis or parathas. 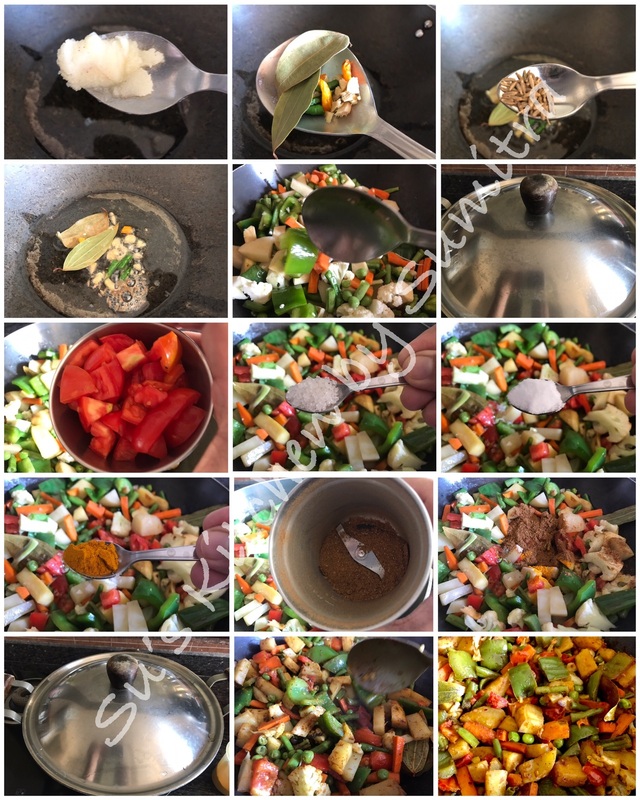 Take a pan, add the pepper corn, cardomom, cloves, cinnamon, red chillies, coriander seeds, cumin seeds, fennel seeds and fenugreek seeds. Roast all the ingredients until you get some good aroma. Switch off the flame, let it cool. Add the ingredients in the grinder and grind the ingredients into a powder. Keep it aside. 1 big bowl of mix vegetables cut into cubes. Take a wok, add ghee, let the ghee melt. Add the ginger, green chillies and bay leaves. Let it sauté for few seconds. Add the cumin seeds, let the seeds crackle. Add the mix vegetables. stir, cover and let it cook on low flame for 2 minutes. Open the lid, add the tomato and stir for a minute. Add the sugar, salt, turmeric powder and the roasted powder. Stir and cover the wok and continue to cook on a low flame until the vegetables are done. Serve the vegetables with hot rotis, chapatis or parthas. This dish is very commonly made in any Bengali home. The method may differ as per the house. This is how I make a quick chicken gravy at my place. It can be enjoyed with hot steamed rice. Take a pressure pan. Add mustard oil, let it heat up. Reduce the flame. Add potatoes and fry them. Remove the potatoes and keep it aside. In the same oil add the bay leaves, cloves, cinnamon, cardamom, pepper corns and green chillies. Let it crackle. Add the ground paste, sauté it for a minute. Add the sugar, salt, turmeric powder, cumin powder and coriander powder. Continue to sauté for another minute. Add the chicken and continue to sauté for another 2 minutes. Add the tomato and stir. Add 2 cups of water and cover the pan with the lid, let the gravy simmer for 5 minutes. Open the lid, add the potatoes. Now close the pressure pan lid and allow 3 to 4 whistles. Switch off the flame. Let pressure release. Open the lid. Drizzle the ghee and sprinkle the garam masala powder. 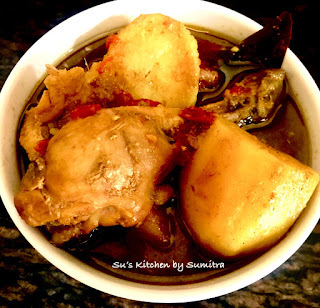 Serve it hot with steamed rice. 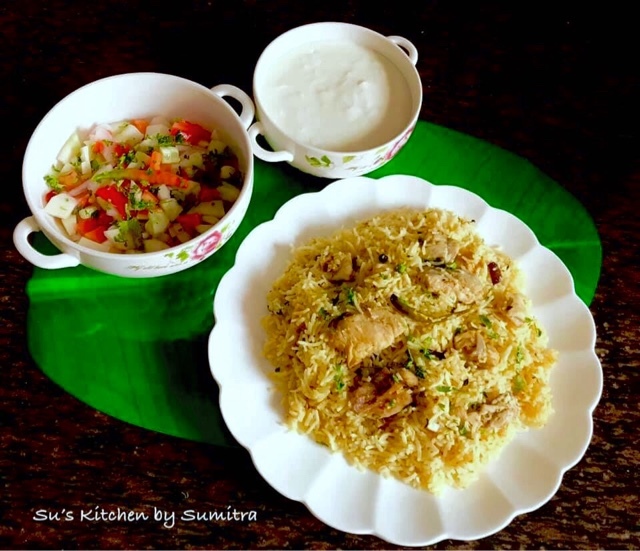 Made this home style Bhetki Pulao which is very quick and easy to cook. This can be made with any boneless fish left in your freezer. Take a pot. Add ghee, let it heat up. Add the cloves, cardamom, cinnamon, pepper corns and bay leaves. Let it crackle. Add the sliced onion and sauté till the onions are translucent. Add the ginger - garlic paste. Continue to sauté for a minute more. 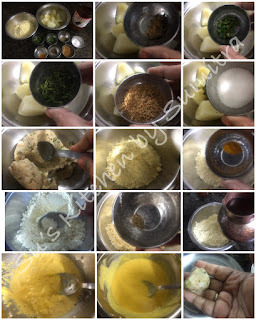 Add the curd, salt, sugar, turmeric powder, chilli powder, cumin power and garam masala powder. Stir and cook for 2 minutes, add the fish pieces and the green chillies, continue to cook for 2 minutes more. 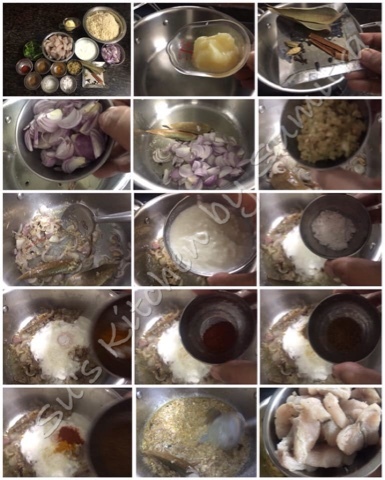 Remove the fish pieces from the masala and keep it aside. Add 4 cups of water. Let it simmer. Add the rice. Let it continue to cook until the rice is almost done. Place the fish on the rice, gently stir the rice, cover and cook for another 2 minutes. Switch off the flame. Open the lid and gently stir it again. Garnish with coriander leaves. Let the pulao stand for 15 minutes before serving, so that the excess vapour will evaporate. It goes well with salad and curd.